Judaea. Alexander Jannaeus (? ), 103 to 76 BC. 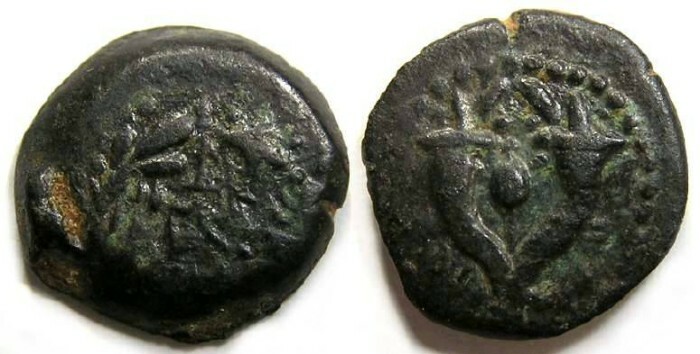 This coin came to me attributed to Alexander Jannaeus, but I cannot read the inscriptions and have made no attempt to confirm it is is actually one of his or one of the other following Jewish Kings who also issued this type (and all of whom are rarer). Reference : Sear Greek-6089 or variety. Size : 12.3 x 13.4 mm. Weight : 1.92 grams. This is a small coin, but average for the issue. Grade : VF and while a little off-center is better than average for this generally poorly struck type. Nearly black natural patination. Obverse : Hebrew inscription in a wreath. Reverse : Crossed double cornucopiae with a pomegranate between them. This type qualifies as a "Widows mite"